For 89 years, the Civic has been shining the spotlight on our community. In good times and times of strife, volunteers have come together to create theatrical experiences of the highest caliber. A cultural cornerstone in Kalamazoo, the civic continues to have a profound impact on our community and the people who live here. Each season, over 30,000 theatre enthusiasts enjoy our productions while 1,000 volunteers dedicate over 50,000 hours to their creation. With an annual budget of $1,900,000 the Civic currently employees 35 full and part time employees as well as dozens of professionals who work on a contractual basis. 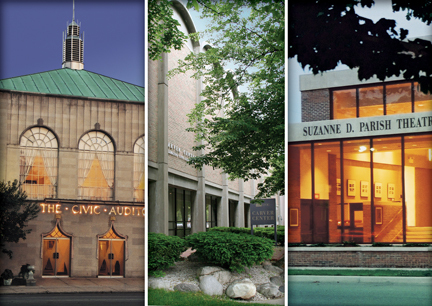 Additionally, the Kalamazoo Civic Theatre serves as a training ground for many young performers and designers, launching many successful careers. As we celebrate our 90th season during 2018-19, we look back on our legacy with pride and gratitude. How fortunate we are that in addition to talent and tenacity, our founders also possessed a great deal of foresight. We've grown and evolved over the years, but our commitment to the standards of excellence established back in 1929 has never wavered. We look forward to a future filled with excitement and challenge as we continue to build upon the foundation, which was set in place so many years ago.